In "Hip Hop: Beyond Beats and Rhymes", filmmaker Byron Hurt takes an in-Depth look at manhood, sexism and homophobia in rap music and hip-hop culture; the program features interviews with Mos Def, Chuck D, Busta Rhymes and Russell Simmons. "Hip Hop: Beyond Beats and Rhymes" is a personal and heartfelt documentary that goes beyond the bling to explore gender roles in hip-hop and rap music through the lens of filmmaker Byron Hurt, a former college quarterback-turned-activist. Producer Russell Simmons says that the poetry reflects society. Therefore, his message is that society is the issue, not the music. Do you agree with this comment? Doesn't the music create and solidify behaviour as much as it reflects it? Finally, can there be change in this media? If so, what changes need to be made and how can they reasonably, and realistically, be implemented. Does there even need to be change. Do some real soul searching and, as always, use the media as your evidence - ALWAYS substantiate your claims, your ideas, and your suggestions for change. Explain yourself really well! Reel Arabs are not Real Arabs! Recently, we have been discussing the mis-representation of Arabs, Muslims, and Middle-Easterners (in general) in media and popular culture. In his book, "Reel Bad Arabs", Dr. Jack Shaheen discovered that out of 1000 films that have Arab & Muslim characters (from the year 1896 to 2000), 12 were positive depictions, 52 were even handed and the rest of the 900 and so were negative . This has major repercussions on how Western society views these people and how they, ultimately, view themselves. Click the YouTube clip above to watch an extended trailer for the film. 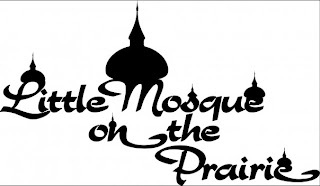 Little Mosque on the Prairie" is the story of the Muslim population in the fictional town of Mercy, Saskatchewan. The show derives much of its humour from the interactions of the Muslims with the non-Muslim townspeople of Mercy and by the contrast of conservative Islamic views (held primarily by the characters of Baber and Fatima) with more liberal interpretations of Islam (as represented by Amaar and Rayyan). The show uses humour to highlight common stereotypes and, insodoing, works towards breaking down misrepresentations and showcasing Muslims in a more realistic light. It's your turn to play media producer! What form(s) of media would you use, and what product or service would you create and promote, to encourage people to go out and discover the "Real" truth about Arabs and Muslims? Why would you choose this particular media and who would your specific audience be? How would you be able to determine if your product is effective (i.e. what type of feedback would you receive and how would you receive it?) Explain why your chosen media product would be effective in persuading your audience. Your explanation MUST be very specific - provide the finer details of your product, its creation, and its content (the message). Respond to AT LEAST TWO (2) other posts from your peers (other members of the class). You must refer to the specific student and post you are commenting on in your response, and you must assess the effectiveness of their campaign academically and constructively using all of the information you have learned during this unit! EXTRA CONSIDERATION AND CREDIT WILL BE GIVEN IF YOU ATTEMPT TO ACTUALLY MAKE THE PRODUCT! The release of Stefani's first solo album brought attention to her entourage of four Harajuku Girls. They were named for the area around the Harajuku Station of Tokyo, Japan, known as a popular shopping destination and fashion center for teenagers. They were featured in her music videos, press coverage and on the album cover for Love. Angel. Music. Baby., and have a song dedicated to them on the album. They were also featured in, and the namesake for, Stefani's successful Harajuku Lovers Tour 2005. However, Stefani's adoption of this Japanese culture component drew criticism from Mihi Ahn of Salon.com, who commented, "she's swallowed a subversive youth culture in Japan and barfed up another image of submissive giggling Asian women". According to the Jan/Feb 2006 edition of Blender magazine, stand-up comic Margaret Cho has labeled the Harajuku Girls as a "minstrel show" that reinforces ethnic stereotypes of Asian women. The Harajuku Girls have since continued to appear alongside Stefani within the media, and are featured in the music video for "Wind It Up" (2006). YOU DEFINITELY NEED TO READ THESE! Is Stefani adapting Japanese culture to fit into North American popular culture, or is she exploiting these girls for her own commercial gain? Is she showcasing this Japanese sub-culture or reinforcing ethnic stereotypes? After you post about the Avril / Rubinoos situation, do some research and find a copyright infringement case that we have not discussed in class. Post it here. It doesn''t have to be music related (but there are a lot of examples here), just something relatively high profile. Be sure to state the facts of the case, provide links (embed YouTube clips for us all to compare), and provide your own opinions based on your specific knowledge of the Copyright Act and the effect that infringement has on both the artist, and on the public as a whole. Brief posts will not count or be considered, but well thought-out and supported posts will earn you an extra 5% on the total of your next major project! Britney's "Comeback" - Is it Fair to Make Fun of Britney's Figure? This past Sunday, at the 2007 MTV Video Music Awards, Britney Spears made her "comeback". Unfortunately, it was less than stellar (to say the least). Moments after, the internet and gossip pages were full of criticism and ridicule about her singing, her dancing, and her body. Is it fair to critisize Britney's figure? What does this ultimately "say" about us as people and as a society? Celebrity Worship Syndrome: Is America?s Obsession With Stardom Becoming Unhealthy? Welcome to the brand spanking new blog for Mr. Puley's Media Studies class at OP!